The right keyboard can make or break a gaming setup. A wrist-rest can improve comfort, while backlighting can help you react in the dark and media keys can help you easily control your music. If you feel like your gaming system is missing out and needs some love, but you don’t want to spend too much, then check out our reviews of our top five picks for the best gaming keyboard under $50. If you’ve been around computers for a while, either for work or for gaming, then you have probably heard of a macro. A macro is when a key is programmed to trigger a more complex series of actions or perform a task. This is very useful in games like MMOs where certain combinations or series of moves are reliably used together, and can also be used in work such as editing and spreadsheets. If you’re looking for the best mechanical keyboard under $50 for macros, then the Corsair K55 is a great choice. 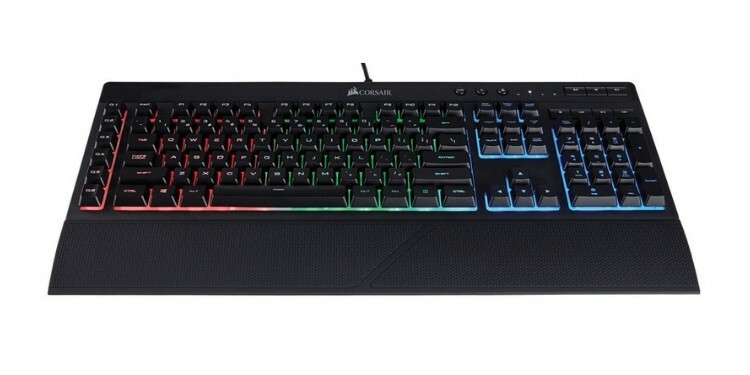 It sports six programmable macros keys along the left side of the keyboard that can be customized in Corsair’s iCUE software. Along with macros, you can also customize the three zone RGB lighting from the iCUE software to personalize the look of your keyboard. This is also the best RGB mechanical keyboard under $50 for comfort thanks to the included wrist rest. Corsair’s wrist rests are firm and made from a rubberized material that offers a good grip and good build quality that is sure to last. There are dedicated media switches on the top right that opt for volume up and volume down buttons rather than a wheel like some of the more premium Corsair keyboard options. The main drawback to this budget-friendly keyboard is that it does not use mechanical switches like the other keyboards in Corsair’s K-series, but instead uses some underwhelming rubber dome switches. 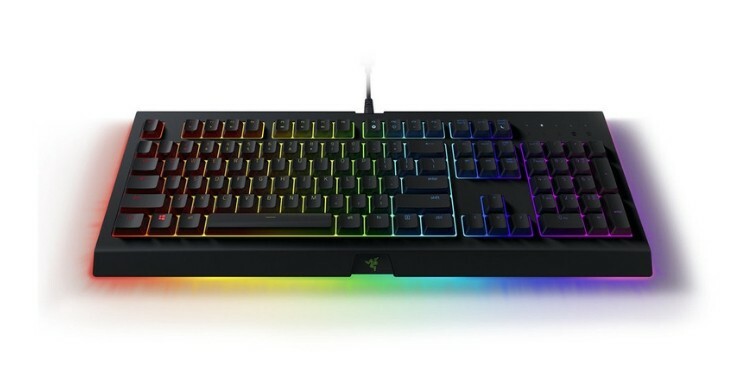 Razer has built a name for itself by building vibrant products that also offer top of the line performance. 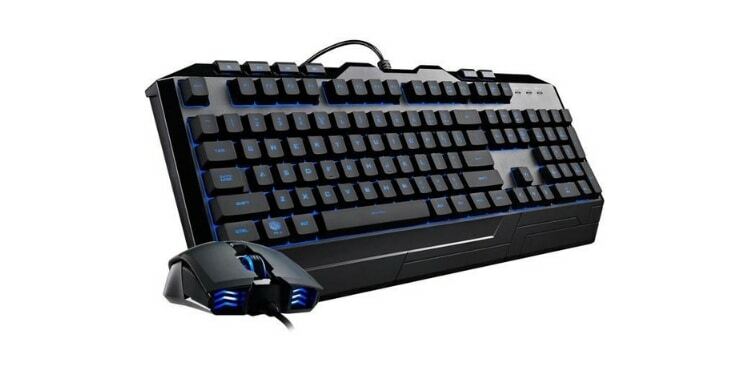 Usually, however, to get your hands on Razer products involves a significant financial investment. This is not the case though with the Cynosa Chroma. The Cynosa Chroma is the best budget gaming keyboard on our list for those looking for vibrant and highly customizable RGB lighting. Razer’s Synapse software allows for an incredible level of customization and lets you choose from 16.8 million colors to set up custom patterns and color schemed for your keyboard. This affordable Razer keyboard is also great for macro users. While it doesn’t have any dedicated macro keys like the Corsair model we just looked at, this one does have a shortcut that allows you to record new macros on the fly. If you’ve ever used a mechanical keyboard before then you know that there really is no going back. The consistent and satisfying feel of mechanical switches simply cannot be beaten by the mushy feel of rubber domes or other types of switches. If you’re looking for a mechanical keyboard that won’t break the bank then the VicTsing mechanical keyboard is a great option (If you’re less interested in budget keyboards than mechanical keyboards, then check out the best on the market). It features similar switches to the popular Cherry MX Blues that boast a tactile bump at the actuation point and an audible click. 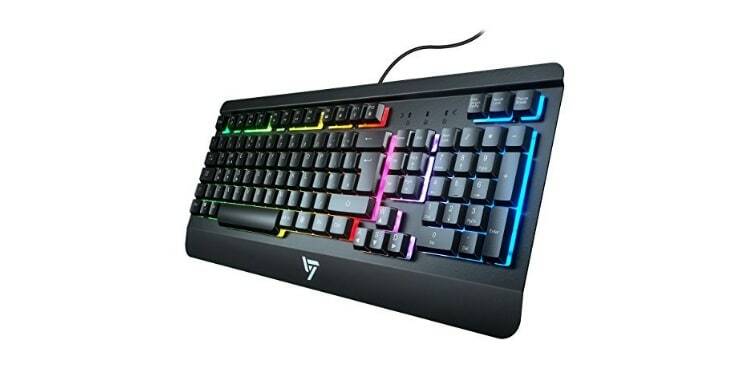 Needless to say at this price point though you won’t be getting real Cherry switches, but VicTsing claims these switches are rated for 50 million clicks, meaning they will last for years. This keyboard also has drainage slots and other water-resistant design features that make it even more durable and reliable. This is a nice addition since mechanical switches are usually not as water resistant as rubber domes. While the last keyboard we looked at had real mechanical switches, it was lacking some of the other features that gamers rely on. Namely, it was missing backlighting, which is incredibly important when trying to find the right key in the heat of battle in the dark of night. 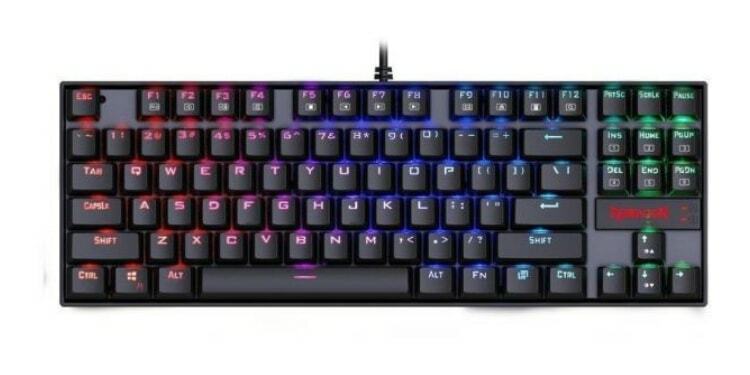 The next keyboard we’re looking at, the Cooler Master Devastator 3, not only has mechanical feeling switches but also has LED backlighting that you can change between seven colors. It is important to point out that this keyboard actually has membrane switches, but uses Cooler Master’s mechanical switch to offer the feel of real mechanical switches. Like the last switches we looked at, these try and emulate the Cherry MX Blue switch meaning it has a tactile bump and audible click. While the mechanical design offers good reliability and a nice feel they are definitely softer and less definite feeling when bottoming out because of it. The last keyboard on our list also uses custom mechanical switches that try and emulate the popular Cherry MX Blue switch. These switches do a much better job than the Cooler Master option and feel pretty convincing even when bottoming out. Even more impressive than the keys though is the durability of this keyboard for the price. The frame of the Redragon K552 is made from mostly metal and is very solid. The mechanical key switches are also durable, and even the keycaps are impressively constructed. The keycaps don’t wear easily and don’t end up with the glossy shine that many cheap keycaps tend to develop over time. The keyboard is backlit with red LED lights and unfortunately cannot be customized through software for either the lighting or macros. That said, there are several versions available including multi-colored RGB instead of red, and a white frame instead of black. Keyboards are a very subjective matter, and while one keyboard may offer an excellent experience for one person it may offer a terrible one for someone else. For this reason, it’s important to know what to look for when shopping for a good gaming keyboard under $50. Below we’re going to take an in-depth look at a few of the most important factors to keep an eye out for when shopping for a budget-friendly keyboard. Macros keys are used in many programs ranging from games to real work in order to get things done with fewer keystrokes. Macro keys are typically programmed in software and then used to trigger a series of key presses or actions. This is very useful in games like MMOs where a given series of abilities or actions can achieve reliable outcomes while playing. Macros are also used in things like video editing and spreadsheet work to help perform repetitive tasks more quickly and with fewer keystrokes. If you’re a macro fanatic then the Corsair K55 is a great option thanks to its six dedicated macro buttons on the left side. The Razer Cynosa is also a great option thanks to its on the fly macro recording capability. Key switches are the component underneath the keycap that is responsible for sending the signal to the computer that a key has been pressed. For the most part, the key switch is responsible for determining how a given keyboard will feel and in some cases how long it will last. Mechanical key switches are generally considered the top of the line option and have a very consistent and satisfying feel paired with a very high level of durability. If you’re on the hunt for an affordable gaming keyboard with mechanical switches then either the Redragon K552 or the VicTsing mechanical keyboard are great options. Both of these keyboards try to use switches that emulate the popular Cherry MX Blue key switch which has tactile feedback and a sharp audible click when pressed. While you will not find keyboards using genuine Cherry MX switches at this price point, several manufacturers including these have gotten very close to replicating them. Backlighting, like mechanical switches, is a feature that you might not be able to fully appreciate until you actually use it. Trying to type on a non-backlit keyboard after getting used to one is like trying to drive an 18 wheeler after riding around in a sports car. Being able to easily and clearly see the keys from any angle and in any lighting makes typing and gaming much quicker and easier. Additionally, RGB lighting lets you customize the look of your keyboard and give it a personalized touch. The Corsair and Razer keyboards on our list offer by far the best RGB lighting on our list, with the Razer option boasting arguably the best software with the most customization.